The key to measuring social is understanding your Return on Relationship, ROR (#RonR), which I believe is measured through organic engagement, community management, sentiment monitoring and much more. It all comes down to one word: value. How do your social media efforts create value for you (as a brand) and for your audience, which then reflects on your brand? What prompts that viewer to come back to your social channel(s) or any other place you’re looking to drive them? Social marketing is less about driving traffic and much more about attracting traffic. It has evolved from seeing who could gather the most likes to seeing who has the most on-target fan base—a simple quality over quantity shift. Measuring the Return on Relationship is not easy, as it involves not only analyzing connection growth but also measuring the overall sentiment of your consumers’ voice in relation to your brand. This includes measuring the organic sharing rates of your content and your channel return rates. Always keep in mind that ROR > ROI. Why? Because ROI will match a fixed period of time, or perhaps be income related, whereas ROR will have “halo” effect (e.g., two projects can have same ROI, but if one was completed with better relationship management, it has the added benefit of a satisfied customer and/or long-term relationship). With regard to cost mitigation, it is important to look at success as generating more impressions than traditional media for the same spend or generating the same impressions for significantly less money (which most often should be the case). This is purely a cost-per-thousand-impression (CPM) play. It’s great for consumer packaged goods brands that have a large marketing budget and view social as simply one part of their communication plan, and it can also work for brands that see the importance of brand awareness. In terms of sales increase, a valuable method of defining the ROI of Social is measuring annualized customer value. Typically, a consumer who regularly absorbs content that references a brand is a more valuable customer than a non-fan/follower/subscriber. This is classic Return on Relationship. They may spend more (average order value), visit more often and make more purchases (frequency of purchase), remain a loyal customer for a longer period of time (lifetime value of a customer) or very often all three. This is very similar to legacy loyalty program metrics. Finding that average value isn’t all that difficult and can give you a KPI for tracking when starting social, ramping it up or pulling it back. In addition, I believe there is a Return on Relationship fostered by all brand relevant content and communication—simply put, the value accrued by a person or brand due to nurturing a relationship. ROI is simple dollars and cents; ROR is the value (both perceived and real) that will accrue over time through loyalty, recommendations and sharing. Getting the right mix is important. Combining consumer-, expert- and influencer-generated content with engagement and amplified online syndication (employee and consumer advocacy, and social ad buys) in a correctly structured and maintained social environment will improve results. Engagement and connection produces search engine optimization results that last, an increase in online share of voice compared to competitors (very important and easily measurable), and engaged impressions and reach that drive brand awareness, loyalty and ultimately sales conversion. In addition, start measuring and looking at how a strong social presence affects your net promoter score quarter to quarter. NPS is the likelihood that a customer would recommend your company/product/service to a friend or colleague. The scoring for this is most often based on a 0 to 10 scale. For existing products, it is defining how existing social platforms (Facebook, Twitter, Instagram, Snapchat, etc.) can support achieving business goals (ROI) and grow or communicate the value that is accrued by a brand due to nurturing a relationship (ROR). Being social drives engagement; engagement drives loyalty and advocacy; and both correlate directly to increased sales. 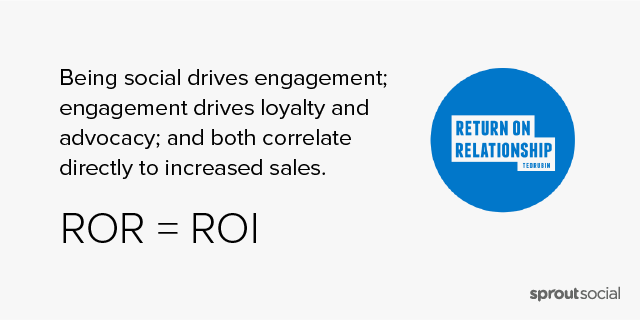 ROR (#RonR) = ROI…and most definitely enhances it at every level. For more information on social relationship building check out Ted Rubin’s book “Return on Relationship“. Ted Rubin: Ted Rubin is a leading Social Marketing Strategist, Keynote Speaker, Brand Evangelist and Acting CMO of Brand Innovators. In March 2009, he started using and evangelizing the term ROR, Return on Relationship™ (#RonR). His book, “Return on Relationship” was released in 2013; “How To Look People in the Eye Digitally” was just released. Connect with Ted at TedRubin.com or @TedRubin.